Submit your profile to AyurvedDoctor for Free! AyurvedDoctor.com gets around 40,000 unique visits per month which is equivalent to around 1200-1500 unique visitors a day. Most of them either look for a doctor for treatment of themselves or for their near & dear one. 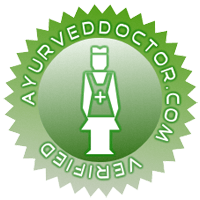 If you are a qualified(certified) Ayurvedic Doctor, we will be proud to publish your profile in AyurvedDoctor.com for free so that patients could contact you directly for treatment. Please fill the below form and submit. We will get back to you as soon as possible and we will publish your profile in our site once the basic verification process is completed. If you do not get any confirmation email or call, please send an email to support@ayurveddoctor.com to check the status. Note: Please add some details in ‘About me’ section. For example, “I have an experience of around 5 years in ayurvedic treatment. I have completed **** certifications, attended **** seminars. You can reach me on my clinic on Monday -Fiday from 8Am to 5PM(only on appointment basis). You can call me on my cellphone to get an appointment “. You can write your achievements etc too. Important Note: If you did not get any reply from us within 3 days, please check in your spam folder to find the email. Specialties can be like panchakarma, arthritis, asthma etc.